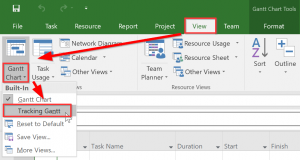 Today I would like to take you on a tour around one of the most useful views in the Microsoft Project Client. The view is called the Tracking Gantt and it contains vital information on the health of your project and it’s progress. This is also another “About” post meaning that I’ll do my best to fill in all the details on this particular subject and I will also share information from outside TPC to give you the full picture. 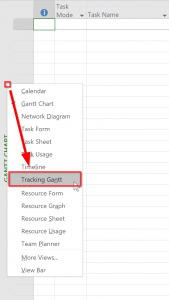 Where can I find the Tracking Gantt? Ok, first things first. 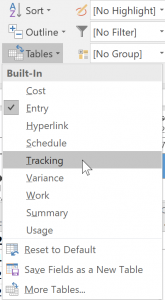 How do you access the default view called Tracking Gantt? I’m using Microsoft Project Online desktop client (version 1710). Which is almost the same as Microsoft Project 2016. These versions have the same menu structure as 2013 and 2010 called the ribbon. Older versions of MS Project have a different menu structure, and you will find the views under the “view” menu item. Navigate to Task –> click on the Gantt Chart dropdown –> it’s the last view there is. 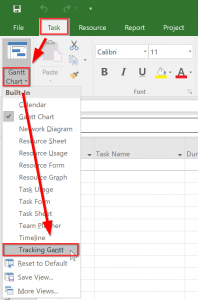 Navigate to View –> click on the Gantt Chart dropdown –> it’s the second option for the “Build-in views”. Right click on the gray bar to the far left from any view (mine was on Gantt Chart) –> the Tracking Gantt will be close to the middle to select. I created a very simple schedule to show together with the Tracking Gantt. This is our starting point and I will take a step by step look at what’s included. Now you might notice the left side of the view didn’t change. This is still the same list of columns that you had earlier. But the right side changed a lot! Most of the tasks have a shorter bar and changed colors, from blue to red. And all the visuals except for the milestones have a percentage next to the bars. The red color indicates the tasks are on the critical path. The chain of tasks and milestones that are responsible for the project finish date. If any of these tasks change the end date of the project changes with them. Notice that Task 7 is still blue, it is not on the critical path. The percentage indicate the tasks percentage complete. How far along are you with the schedule as a whole can be found on summary tasks and the Project summary task (the gray line on top). Now add a baseline – some more fun! I’ve been a big fan of the baseline functionality, and I’ve covered this in multiple posts already such as this one describing multiple baselines (Thanks Bonnie) and About baselines. With the addition of the baseline there’s a new dimension to the schedule’s visual representation. The dark bars we see on the tasks represent the originally intended schedule; the baseline. On this visual we see that we are running behind and it is also clear that “Task 4” is the culprit. This makes it very easy for everyone looking at this schedule to take action. But what about the left side? Now that we took a look at the visual part. Let’s dive a bit deeper and try to find the most interesting table to contribute to your tracking needs. There are two I would like to take a look at. Find these tables in the “Tables” drop down list on the view ribbon tab. 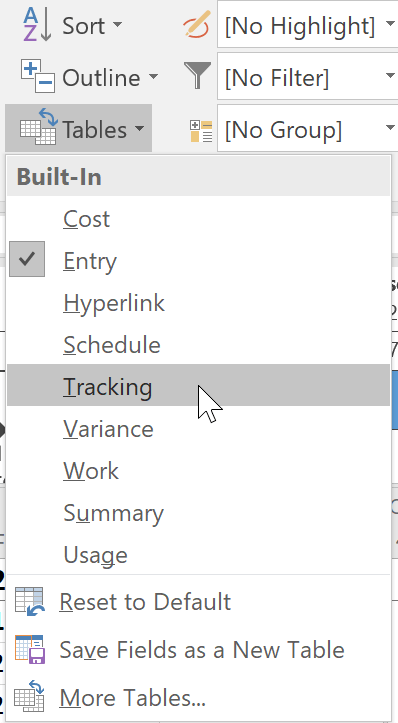 The Tracking table contains a lot of “Actual” data. The columns are Actual Start, Actual Finish, % complete, Physical % complete, Actual Duration, Remaining Duration, Actual Cost and Actual Work. All these values will automatically contain information when you update the schedule. The Variance table contains variance data. The columns are Start, Finish, Baseline Start, Baseline Finish, Start variance, Finish variance. But it lacks some of the more interesting variance columns: Duration variance, Cost variance and Work variance. These are also available, but you will need to add them to the table yourself. Another interesting column that you might want to add is called “Free slack”. This will show the amount of duration a task can take longer before it’s on the Critical Path. This posts idea started when I did a couple of training courses on Microsoft Project. During these sessions the trainees were amazed about the content in this single view. I looked around and I couldn’t find a article that would do a deep dive into the Tracking Gantt. So why not be that guy that does the article, right? If you know of anything of interest in regards to this view please let me know in the comment. It will make this article even better if you are able to contribute that way. Last thing before I go: If you liked this article, you might also like to get a short e-mail from me every 2 months describing what’s new in TPC, Microsoft Project and Project Online. The TPC newsletter provides that source of information.